There is virtually universal agreement that the fundamental cause of the global economic and financial crisis of 2007-09 was the combination of a credit boom and a housing bubble, but it is much less clear why this combination of events led to such a severe financial crisis. 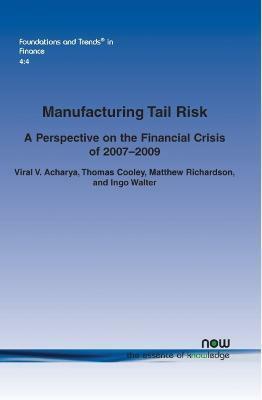 Manufacturing Tail Risk argues that what made this economic shock unique and led to such a severe financial crisis was the behavior of many of the large, complex financial institutions (LCFIs) that today dominate the financial industry. These LCFIs ignored their own business model of securitization and chose not to transfer credit risk to other investors. Instead, they employed securitization to manufacture and retain tail risk that was systemic in nature and inadequately capitalized. This book provides a brief history of how the U.S. financial system evolved into its current form. It presents the manner in which banks built tail (systemic) risk exposures in large measure to get around capital requirements, in contrast to their earlier business models, and it explains how lax regulation contributed to these outcomes. It also examines alternative explanations for the financial crisis. The authors conclude that global imbalances and loose monetary policy were relevant proximate contributors to the crisis by producing an asset-price bubble in the United States that ultimately led to the financial crisis. It concludes with a discussion of possible remedies to charge banks for manufacturing tail risks and to contain such propensity in the first place. And while the focus is on the United States, the authors review risk-taking and realized losses by LCFIs in other parts of the world. Should Banks' Stress Test Results be Disclosed? 1. Introduction. 2. How Did We Get There? 3. The New Banking Model of Manufacturing Tail Risk. 4. Alternative Explanations of the Financial Crisis. 5. Conclusion. Appendix. References.